This is the reduced voltage starting method. Voltage reduction during star-delta starting is achieved by physically reconfiguring the motor windings as illustrated in the figure below. During starting the motor windings are connected in star configuration and this reduces the voltage across each winding 3. This also reduces the torque by a factor of three. After a period of time the winding are reconfigured as delta and the motor runs normally. Star/Delta starters are probably the most common reduced voltage starters. They are used in an attempt to reduce the start current applied to the motor during start as a means of reducing the disturbances and interference on the electrical supply. Traditionally in many supply regions, there has been a requirement to fit a reduced voltage starter on all motors greater than 5HP (4KW). The Star/Delta (or Wye/Delta) starter is one of the lowest cost electromechanical reduced voltage starters that can be applied. 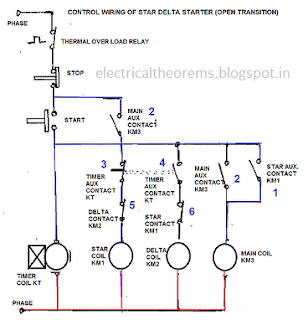 The Star/Delta starter is manufactured from three contactors, a timer and a thermal overload. The contactors are smaller than the single contactor used in a Direct on Line starter as they are controlling winding currents only. The currents through the winding are 1/root 3 (58%) of the current in the line. The ON push button starts the circuit by initially energizing Star Contactor Coil (KM1) of star circuit and Timer Coil (KT) circuit. When Star Contactor Coil (KM1) energized, Star Main and Auxiliary contactor change its position from NO to NC. When Star Auxiliary Contactor (1)( which is placed on Main Contactor coil circuit )became NO to NC it’s complete The Circuit of Main contactor Coil (KM3) so Main Contactor Coil energized and Main Contactor’s Main and Auxiliary Contactor Change its Position from NO To NC. This sequence happens in a friction of time. After pushing the ON push button switch, the auxiliary contact of the main contactor coil (2) which is connected in parallel across the ON push button will become NO to NC, thereby providing a latch to hold the main contactor coil activated which eventually maintains the control circuit active even after releasing the ON push button switch. When Star Main Contactor (KM1) close its connect Motor connects on STAR and it’s connected in STAR until Time Delay Auxiliary contact KT (3) become NC to NO. Once the time delay is reached its specified Time, the timer’s auxiliary contacts (KT)(3) in Star Coil circuit will change its position from NC to NO and at the Same Time Auxiliary contactor (KT) in Delta Coil Circuit(4) change its Position from NO To NC so Delta coil energized and Delta Main Contactor becomes NO To NC. Now Motor terminal connection change from star to delta connection. A normally close auxiliary contact from both star and delta contactors (5&6)are also placed opposite of both star and delta contactor coils, these interlock contacts serves as safety switches to prevent simultaneous activation of both star and delta contactor coils, so that one cannot be activated without the other deactivated first. Thus, the delta contactor coil cannot be active when the star contactor coil is active, and similarly, the star contactor coil cannot also be active while the delta contactor coil is active. The control circuit above also provides two interrupting contacts to shutdown the motor. The OFF push button switch break the control circuit and the motor when necessary. The thermal overload contact is a protective device which automatically opens the STOP Control circuit in case when motor overload current is detected by the thermal overload relay, this is to prevent burning of the motor in case of excessive load beyond the rated capacity of the motor is detected by the thermal overload relay. At some point during starting it is necessary to change from a star connected winding to a delta connected winding. Power and control circuits can be arranged to this in one of two ways – open transition or closed transition.